When it comes to beauty hauls, I don't tend to purchase them as regularly as fashion hauls. Mainly because I work in beauty marketing and get a ton of products to try and test and then there's always the freebies to use! To prove a point, I have a very large box underneath my bed with everything from body scrubs to nail and feet treatments, it really shows my addiction to beauty products. La Roche Posay is a brand I've been meaning to try for the past year or two. Bloggers have raved about the Serozinc Toner working well for oily and blemish prone skin and recently my skin has been breaking out a lot along my jaw line. I've really enjoyed using it both morning and night to prep my skin before moisturising, and so far so good! The La Roche Posay Effaclar Duo + has been another lovely product to use with the Serozinc. I'll apply it after the toner and before my usual moisturiser to help clear out my spots and blemishes. It's super light and nourishing and I'm hoping to see some results a few weeks down the line. I went for a facial a few months ago and the beauty therapist recommended the Hydra Floral range from Decleor. Not only is this brand a favourite of mine already, but their skincare products just agree with my skin so well. The Hydra Floral is a SPF30 anti-pollution hydrating fluid with neroli essential oil and moringa extract, aimed for pollution and stressed skin. Working in London during the week, it's dawned on me just how polluted my skin has become since working there, which is why I chose this to help protect my skin. SPF is always a bonus for me as my english rose skin doesn't always agree with the sunshine! With added neroli essential oil, which uplifts the skin and morgina extract that creates a protective film against pollution. The Hydra Floral range targets specifically dry skin, without leaving it too oily or shiny - a pet hate of mine! One downside is that the packaging did come damaged, but it luckily didn't affect the product inside. If you haven't been introduced to Korres yet, let me do the honour. Since finding this brand a few years ago from a Christmas present, there's been no going back! I picked up their Water Lily Blossom Shower Gel, which was on buy one get one free offer. I go through shower gels like there's no tomorrow and like to keep a few stocked up. I reviewed their range last year and have since returned to it! What I love about Korres is that it's a simply natural brand with no frills attached to it. Their skincare has been raved about, their bodycare ranges are being added to and bloggers love their makeup collection. 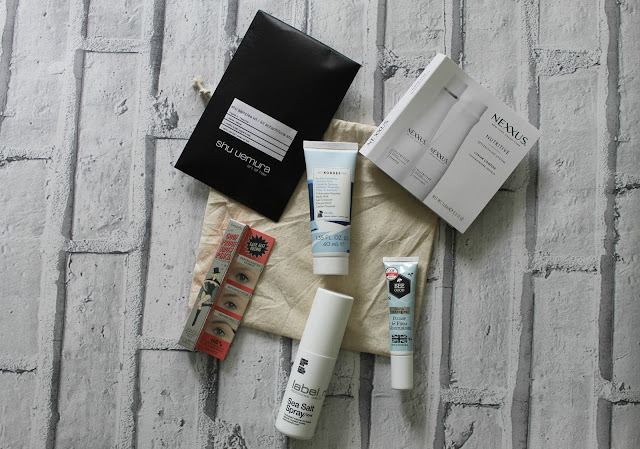 If you're looking for more info on the brand, check out my Brand Highlight: Korres post. With orders over £55 on lookfantastic.com, you'll receive a free beauty bag! I didn't take photos of everything I bought, because there's a special present for my sister that I bought and I know she reads this blog sometimes and didn't want to ruin it. Anyway, what I wasn't expecting was a bag full of mini beauty products from my favourite brands! First I received a shampoo and conditioner sample from Shu Uemura, which are for extremely damaged hair and will be good for after my holiday in September. Next was another shampoo and conditioner sample from a New York brand called Nexxus, which has a posh caviar complex! In the bag was a travel size Korres Body Milk in their Santorini Vine scent, a mini Benefit Goof Proof Brow Pencil (thankfully in my shade!) a label.m Sea Salt Spray, which I'll be taking on holiday with me and finally a Bee Good Plump and Firm Moisturiser. All in all a pretty good free product! My overall first experience of shopping on lookfantastic.com was a great one - and somewhere I'd definitely return to shop again as their discounts and free products are amazing. Have you shopped on lookfantastic.com before? What's your favourite product?